AMD to give R600 the 65nm squeeze? AMD's existing high-performance card, the Radeon X1950, is based on 90nm technology. AMD 's much delayed DirectX 10 graphics chip, codenamed R600 , will be based on the very latest 65nm manufacturing technology. So says the internet rumour mill following the smorgasbord of technology that is the CeBIT trade fair in Hanover, Germany. But is it true? In recent days, several sources, including senior AMD executives and add-in board partners HIS , have been cited concerning AMD's alleged plans to defenestrate the troubled 80nm spin of the upcoming R600 flagship GPU in favour of leapfrogging directly to the smaller 65nm production node. 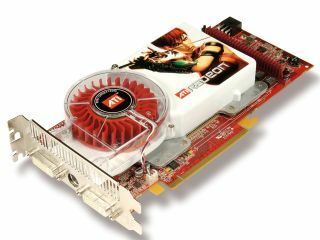 The company's existing high end GPU, the Radeon X1950 , is based on 90nm technology. The rumours come in the wake of AMD's announcement in February that R600 would be delayed until the second quarter of 2007. Several possible factors to account for R600's tardiness have been mooted, including a fault involving its 512-bit memory controller, power leakage from the chip itself and problems surrounding the use of the latest GDDR4 graphics memory. Another, more strategic, explanation for R600's delay is cost. With an anticipated transistor count of over 700 million, R600 would be an extremely large and expensive chip if based on existing 90nm or 80nm production technology. By using the finer 65nm process, AMD could not only price R600-based graphics boards more competitively against Nvidia's competing DirectX 10 GPU, the GeForce 8800, but also achieve higher clockspeeds and perhaps mop up the power leakage problem. A 65nm launch for R600, therefore, would undoubtedly bring advantages. But is it even possible? AMD certainly has access to 65nm graphics chip production courtesy of production partner TSMC. It has been officially confirmed that the Taiwanese chip manufacturing specialist is already ramping 65nm production of the mainstream members of the R600 family, known as RV610 and RV630. In that context, perhaps AMD decided to delay the flagship R600 GPU in order to launch an entire family of brand new 65nm DirectX 10 graphics chips in early May. To confuse matters further, during a presentation at the CeBIT fair, senior AMD suit Rick Bergman reportedly outlined plans for a 65nm revision of the R600 chip, destined for notebooks later this year. So, here's the rub. None of the many R600 engineering boards which have been caught in the wild are thought to have been based on a 65nm chip. Furthermore, the scuttlebutt from Tech.co.uk's spies on the floor at CeBIT indicated that this is one rumour that is well wide of the mark. AMD originally had the 65nm die shrink of R600 pencilled in for late 2007. Given the company's recent track record for launching high end GPUs on cutting edge processes (remember the catastrophically delayed R520 chip), bringing the 65nm variant of R600 forward by several months would be a spectacular turn around in form. And yet there is one recent event that suggests AMD might just pull it off. Ironically, it comes courtesy of bitter rival Nvidia. The revolutionary unified shader architecture of the GeForce 8800 was a real shock to most observers and a reminder that surprises are still possible, despite the efforts of the great hordes of technology bloggers and newshounds. Meanwhile...although the exact status of R600's process technology has yet to be confirmed, AMD did reveal one or two tasty new details at the CeBIT show. First up is a new hardware video decoding engine, to be fitted to the entire R600 family. The UVD (Universal Video Decoding) engine is a dedicated decoding engine which crucially delivers support for MPEG-4 AVC (aka H.264) and VC-1 at bitrates up to 40Mbit/s. In other words, with an R600-class chip in your PC, smooth playback of both HD-DVD and Blu-ray disks should be guaranteed.